The cheapest source of new electricity in 2017 was wind (3 - 6¢/kWh), followed by utility-scale solar (4.6 - 5.3¢/kWh). Natural gas (4.2 - 7.8¢/kWh) beats coal (6.0 - 14.3¢/kWh), and in states with wholesale competition, the cheaper fracked gas is driving coal and nuclear out of the market (in monopoly states, utilities can protect their uneconomic coal plants). In some competitive states, there are "around-market" policies that protect expensive nuclear assets by assigning a value to their low-carbon electricity. The cost of solar and wind energy (and battery energy storage) will continue to decline, because these are technologies. Technologies typically follow a declining cost curve as the technology improves and as mass production scales up (see "Cost Reductions in Disruptive Technologies"). In contrast, the cost of electricity from fuel-based sources is likely to remain the same or increase over time. 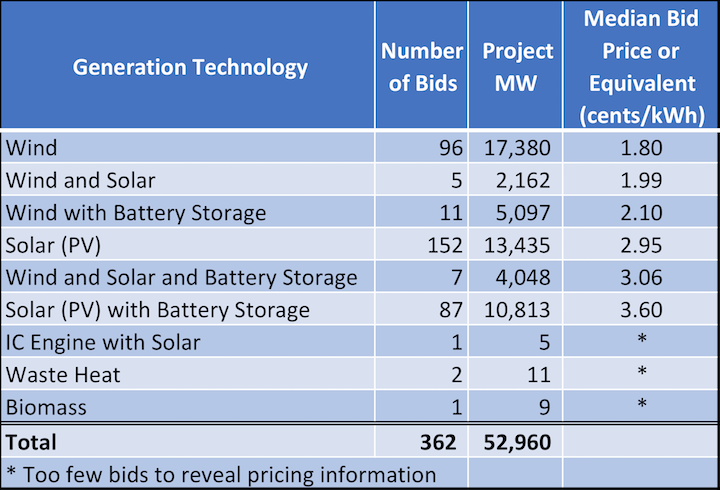 Below: bids received by Xcel Energy in Colorado in late 2017, for wind to be installed in 2021 and solar or solar+storage to be installed in 2023. Prices are the median (middle) of the range of bids received (Source | Article 1 | Article 2). These prices are extraordinarily low, even below just the operating cost of most Colorado coal and natural gas plants, suggesting that the economic case to retire coal and gas plants will only strengthen over time. Two particular items to note: 1) the total size of projects that were bid (52,960 MW) is nine times the capacity of Xcel's entire generation fleet (so, an overwhelming response of competitive offers); and 2) solar+storage allows variable solar energy to be "time-shifted" from when it's produced to times of peak demand, so the cost of 3.6 ¢/kWh can be compared to "gas peaker" plants which serve this same purpose but at a median cost (in 2017) of 15.6 - 21.0¢/kWh.